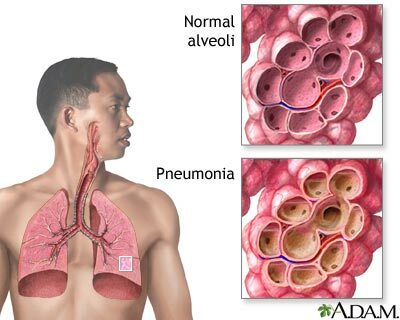 Pneumonia is a serious lung disorder and an inflammatory condition of the lung, leading to a number of Patients being admitted to Intensive Care—affecting primarily the microscopic air sacs known as alveoli. It is usually caused by infection with viruses or bacteria and less commonly other microorganisms, certain drugs and other conditions such as autoimmune diseases. This makes the absorption of Oxygen in the lungs very difficult and as a result the Patient with Pneumonia generally feels difficulties and an increased effort in breathing. Typical symptoms include a cough, chest pain, fever, and difficulty breathing. Diagnostic tools include Chest X-ray and culture of the sputum. Vaccines to prevent certain types of pneumonia are available. Treatment depends on the underlying cause. Presumed bacterial pneumonia is treated with antibiotics. If the pneumonia is severe, the affected person is generally admitted to hospital. Annually, pneumonia affects approximately 450 million people, seven percent of the world’s total, and results in about 4 million deaths. Although pneumonia was regarded by William Osler in the 19th century as “the captain of the men of death”,[ the advent of antibiotic therapy and vaccines in the 20th century has seen improvements in survival. Nevertheless, in developing countries, and among the very old, the very young and the chronically ill, Pneumonia remains a leading cause of death. 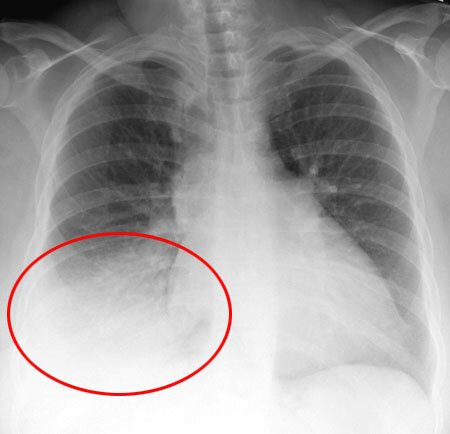 Chest x-ray showing pneumonia (circle) of the right middle lobe. Pneumonia caused by Klebsiella may have bloody sputum often described as “currant jelly”. Bloody sputum (known as hemoptysis) may also occur with tuberculosis, Gram-negative Pneumonia, and lung abscesses as well as more commonly with acute bronchitis. Mycoplasma Pneumonia may occur in association with swelling of the lymph nodes in the neck, joint pain, or a middle ear infection. Viral Pneumonia presents more commonly with wheezing than does bacterial pneumonia. The cause of the infection is investigated and drug treatment will differ according to the suspected or known organism. Management of your loved one is dependent on how critically ill they have become. Treatment includes oxygen and antibiotics to fight the infection. How long your loved one requires therapy in Intensive Care depends largely on the severity of the Pneumonia and on your loved ones immune system to fight the infection. It also depends on how well the Antibiotic therapy counteracts the infection. Another factor impacting on your loved ones length of stay in Intensive Care is whether and how long they need Non- Invasive Ventilation(NIV) or BIPAP ventilation. If Non-Invasive BIPAP ventilation is not sufficient and your loved one requires a Breathing Tube (endotracheal tube) and mechanical ventilation on Ventilators (Breathing Machines) the length of stay or length of time usually goes up and may exceed 3-4 days, sometimes up to two weeks. Most Patients admitted to Intensive Care with Pneumonia fully recover, but in some severe cases few Patients may die.